Arnaud Djoum has set his sights on a move away from Hearts, eyeing a switch to one of Europe’s five major leagues. Speaking ahead of the Confederations Cup, where he is representing Cameroon following their Africa Cup of Nations win, the midfielder gave the clearest indication yet that he sees his future away from Tynecastle. 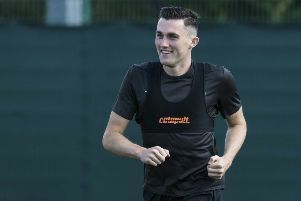 The 28-year-old, who began his career began his career with R.W.D.M Brussels before moving on to Anderlecht then Dutch side Roda JC, told Goal.com that he wants a move away from Scotland following the conclusion of the tournament. While Djoum still has two years left on his contract at Hearts, it is not the first time he has spoken of his desire to test himself at the top level, previously telling Cameroon publication Le Jour he was looking to “take a step towards a better club”. Ligue 1 side Bordeaux have been linked with a move for the midfielder. Les Girondins finished sixth in the French top-flight, earning a sport in the Europa League third qualifying round. It is a move which would interest the midfielder who won the Hearts supporters’ Player of the Year for season 2015/2016 at the club’s end of season awards. Djoum arrived at Hearts in September 2015 following an itinerant year, moving from the Netherlands to Turkish side Akhisarspor and then on to Polish outfit Lech Poznan, making 23 appearances in total. After being frozen out at Poznan he found stability at Tynecastle, making 72 appearances across the past two seasons, netting 12 goals. Despite representing Belgium at youth level his form in Scotland earned him a call-up to the Cameroon national team, helping the country to the Africa Cup of Nations success earlier this year. Cameroon get their Confederations Cup campaign under way on Sunday (18 April) against Chile, before matches with Australia and Germany.